With possible historic changes on the horizon as the New Jersey Legislature moves toward allowing recreational marijuana, School Leader magazine spoke with school boards association officials in states where cannabis is already legal and asked how it affected children in their state. None of the school boards associations publicly lobbied for or against ending pot prohibition. In most states, marijuana legalization began when voters approved it. Vermont — like New Jersey — did not put the issue before its voters. Some school boards associations in states where marijuana is now legal expressed concerns about the possible impact on students’ health. Others, however, saw it as no big deal. In Massachusetts, for example, school boards executive director Glenn Koocher dismissed the idea of taking a stand — especially because recreational marijuana remains illegal for anyone under the age of 21. “We decided that we probably couldn’t support the legalization question, but no one wanted to oppose legalization either, so we took no position,” he said. Increased access: About half of the California Delegate Assembly attendees reported that, after legalization, students had greater access to marijuana and that this resulted in increased use by parents and students. Some of the delegates reported that young children came to school smelling of marijuana because parents smoked it near them, according to the CSBA. Difficult detection: California delegates reported challenges identifying marijuana baked into everyday lunchbox items or used in vaping devices that look like pens. The challenge has especially affected high schools. Several delegates said calls to 911 increased due to students ingesting edible marijuana at school and not understanding the potency, the CSBA said. “Regarding legalization in 2016, CSBA did not take a position on the (Proposition 64) voter initiative, but rather focused on providing information to our members about the potential impact of legalization on schools,” Ambrose said. The California association issued three papers late in 2018 on the impact of marijuana legalization on K-12 education. The papers provide details on the current status and future expectations for legalization, the use of medical marijuana in schools and the effect of marijuana on the brain. The box that accompanies this article provides links to the full text of the papers. Legalization in Colorado The Colorado Association of School Boards (CASB) has had mixed feelings about recreational legalization, said Kathy Shannon, general counsel for the organization. “The CASB Board of Directors did not take a position on Amendment 64 (which legalized the sale of recreational weed in 2012) nor did CASB expend any resources lobbying against its passage,” she said. Ironically, in the years following legalization, the revenue set aside for school construction has created challenges to school districts’ ability to get construction ballot questions approved, Shannon said. Meanwhile, in Michigan, Don Wotruba, executive director of that state’s school boards association, said the issue did not motivate many school boards to take a stand on the legalization initiative, which voters approved on Nov. 6, 2018. “We had a handful of school boards opposing the ballot initiative,” he said, “but there wasn’t a push for us to take a position.” Tax revenue from the sale of marijuana, he said, would be inconsequential for Michigan’s public schools. Data on Effect of Use Is Incomplete Much of the data on the effect of marijuana use is inconclusive. For example, during the November 2018 campaign to legalize weed in Michigan, newspapers reported that lobbyists on both sides of the issue used the same data to prove different points. In Colorado, the anti-pot side has said the number of schoolchildren who accidentally ingested marijuana more than doubled after legalization. However, the pro-legalization forces examined the data and came to a different conclusion. While it is true that the incidents increased, they say, the numbers were small. Eight kids accidentally ingested marijuana-infused edibles in 2013. That number rose to 14 in the first eight months of 2014. The national Youth Risk Behavior Survey (YRBS) monitors health behaviors that contribute to the leading causes of death, disability, and social problems among youth and adults in the United States. The national YRBS provides data every two years on ninth- through 12th-grade students in public and private schools throughout the United States. The YRBS study tracked the number of high school students who reported using marijuana. In 1991, 31.3 percent said they had tried marijuana, and 7.4 percent smoked it before they were 13 years old. Usage peaked in 1999, when 47.2 percent tried it, and 11.3 percent used it before age 13. More recently, the numbers have decreased. By 2017, 35.6 percent of high school-age students had tried it, and only 6.8 percent smoked it before the age of 13. Traffic Accident Data Controversial Alcohol-related traffic accidents typically outnumber marijuana accidents by a wide margin, leading pot advocates to claim that fewer drivers smoking pot crash their cars. However, law enforcement officials point out that tests for driving under the influence of marijuana are rarely done because they are expensive and take a long time to come back from the lab. Alcohol test results are available immediately at the scene of an accident. Big Money Other factors are at play. Legalization proponents say it would end a long history of racially unbalanced enforcement of the law. Money could be saved by freeing those incarcerated on minor drug offenses, and money could be brought into the state by marketing recreational pot. The Office of Legislative Services, the research arm of the New Jersey Legislature, estimates that legalized marijuana would bring in $210.3 million in additional state revenues annually, equivalent to less than 1 percent of the $38 billion state budget. The estimate is based on proposed legislation that would affix a 12 percent tax (existing state sales tax plus a new excise tax) to purchases. Gov. Phil Murphy, however, favors a 25 percent tax. New Jersey, with a population of approximately 9 million, could see about $900 million in cannabis sales per year by 2025, John Kagia of New Frontier Data told the Star-Ledger’s NJ Cannabis Insider publication in December. Kris Krane, president of 4Front, a cannabis investment firm, said a state like Michigan, which voted to begin the recreational legalization process in November 2018, is ready to grow faster than New Jersey, due to the size of its existing medical market, which is nearly six times the size of New Jersey’s patient base. Given the uncertainty surrounding how quickly adult-use recreational sales could start in New Jersey, Kagia told NJ Cannabis Insider, New Jersey could face an activation period of two years, similar to Massachusetts. It also took many months in California, Vermont and Colorado before legal recreational sales began. In his budget address in March 2018, Governor Murphy said social justice convinced him that legalizing weed was necessary. “We must recommit to opening the doors to economic opportunity for the thousands of young men and women — especially young men and women of color — jailed for non-violent drug-related offenses,” Murphy told the Legislature. “Our current system has failed them, and put a mark on them that they will carry for their entire lives, preventing them from furthering their educations or getting jobs. “It’s the principal reason I advocate for legalizing adult-use marijuana. According to research, New Jersey spends upwards of $140 million per year adjudicating low-level marijuana possession offenses. And, marijuana-related arrest rates are tilted three-to-one against African-Americans, even though rates of marijuana use are similar among races,” Murphy said. A 2016 NPR report, however, cited a Colorado Health Department survey indicating that, in the two years after legalization, arrests for underage marijuana use increased by 50 percent for African-Americans and 20 percent for Latinos, while falling by 10 percent for white youth. Sen. Ronald L. Rice of Newark, an opponent of full legalization, has cited these statistics and last fall called for a study of the impact of legalization on communities of color. Last year, Rice, along with Sen. Robert Singer of Monmouth and Ocean counties, introduced legislation to decriminalize possession of small amounts of marijuana as an alternative to full legalization. Murphy, however, believes that decriminalization, rather than legalization, will not end the racial disparities. And Senate President Steve Sweeney has said he will not move a decriminalization bill forward, stating that full legalization with adequate management and regulation is the preferable course. In Vermont, efforts to regulate and tax the sale of legal marijuana failed. “In effect, we got the worst of both worlds,” said Nicole Mace, executive director of the Vermont School Boards Association (VSBA). It’s legal to possess less than an ounce, but it’s not legal to purchase pot in Vermont. Because it is illegal to purchase marijuana in Vermont, no tax revenue is being generated. The VSBA Board of Directors split on the legalization issue and did not take a stand. However, a resolution expressing concern about the impact of legalization was approved by the VSBA, based on a paper issued by the Vermont Department of Health. Early and persistent use of marijuana can lead to the development of anxiety disorders later in life. Marijuana use may lead to development of depressive disorders. Among individuals at risk for the development of some psychotic disorders, marijuana use may increase the risk or mean that onset of those disorders begins earlier in life, according to the Vermont Department of Health. Marijuana use may affect the physical structure of the brain. The exact effect, whether it is reversible, and what the potential health implications are, remains unknown. Early and continuous use of marijuana significantly increases risk of not completing high school, not enrolling or completing college, low educational achievement, and lower income. Marijuana use among high school and college students negatively impacts academic outcomes. This is a “dose-response relationship,” which means the more a student uses, the worse the outcomes. The research on the relationship between marijuana use and academic outcomes is almost sufficient to show a cause-and-effect link between the two. Youth in more vulnerable situations (e.g. those already experiencing behavior or mental health problems) are more likely to experience a negative academic outcome due to marijuana use. A Moment in Time Supporters of legalization of adult recreational-use marijuana in New Jersey characterize it as inevitable. In a recent post, Justin Zaremba of the Star-Ledger’s NJ Cannabis Insider publication, documents legalization’s momentum. “The tide continues to swell,” Zaremba wrote. “States without a medicinal cannabis program are currently in the minority in the United States and 20 percent of states have legalized adult-use cannabis. “Increasingly, a main driver of the legalization zeitgeist is cannatourism. As states end prohibition, market access opens up to people regardless of where they live, making adult-use states an attractive getaway for cannatourists. And when people travel, they have been known to spend money. “Make no mistake about it: the neighbors of adult-use states are looking at the incoming revenue figures as well. Just as New Jersey and New York are vying to beat each other to market, legislators in Illinois and Ohio are likewise pondering whether to jump in, said Zaremba. While that may be the view of those who believe an era of pot prohibition is ending, about three thousand miles west of Trenton, Tim Garchow, executive director of the Washington State School Directors Association, expressed a decidedly different point of view. Garchow explained that no responsible, elected school board member should publicly support legalizing pot because of existing federal law. The federal government still lists marijuana as a Schedule 1 drug, the most restrictive category. As Time Magazine notes in “A Brief History of Marijuana Law in America,” as part of then-President Nixon’s “war on drugs,” the Controlled Substances Act categorized cannabis as a Schedule 1 drug, in the same class as heroin and LSD. As early as 1972, the Shafer Commission, an investigative body appointed by Nixon, recommended that marijuana be decriminalized. Nixon vehemently rejected the Commission’s report. Today marijuana possession and use remains a federal crime. School boards that flout federal law risk having their federal funding cut. As long as that is the case, Garchow said, he would offer this advice to New Jersey boards of education. “We have concentrated our efforts on helping our kids make healthy choices,” he said. He has tried to keep his members out of the controversy, instead focusing on their central mission. Nothing else, he said, should matter as much. Included is information on issues that local districts in California are facing due to the legalization of marijuana, on local and employers’ rights and restrictions, and federal and state marijuana policy. While the issue was being debated by the Legislature, the Vermont School Boards Association position paper regarding legalization addressed the association’s concerns. NJSBA Sample Policy on Medical MarijuanaThe NJSBA Medical Marijuana Policy offers guidance to school districts regarding the use of medical marijuana in schools. 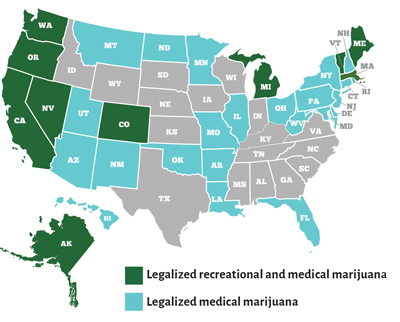 National Conference of State Legislatures (NCSL) The NCSL’s summary of medical marijuana laws around the country. The Impact of Marijuana Legalization on K-12: Use of Medical Marijuana in Schools (11/18) The paper includes the definition of medical marijuana; details regarding school districts rights and restrictions regarding medical marijuana use by students and staff, and information on pharmaceutical advances. The Impact of Marijuana Legalization on K-12: The Effect of Marijuana on the Brain (11/18) Included is information on the difference between medical marijuana and medicinal marijuana; brain research on the effects of use of recreational marijuana and the adolescent brain; and what is known about the effects of second-hand marijuana smoke on children and infants. Alan Guenther is NJSBA’s assistant editor.